Each year, York Maze in the bucolic English countryside sculpts its cornfields into elaborate labyrinths that, from the air, look like stuff. In the past, that stuff has included Harry Potter, Big Ben, and other such quintessentially British things. This summer, as reported by The Press and elsewhere, that thing is Doctor Who. Colin Baker (a.k.a. 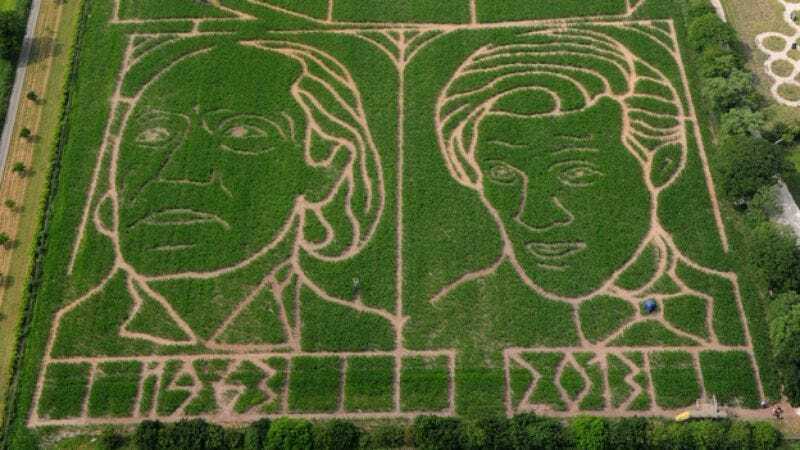 The Sixth Doctor) presided over the opening ceremony of the York Maze today, which has been shaped to resemble the faces of The First Doctor, William Hartnell, and the Eleventh Doctor, the soon-to-depart Matt Smith. Looming over them is a 300-meter depiction of a Dalek, the Doctor’s most iconic enemy. The York Maze opens to the public tomorrow.